This interview, written by Philip Girvan, StFXAUT Communications Officer, appears in the Summer 2018 edition of The Beacon. The Beacon regularly features interviews with StFX University Alumni on the topic of their relationships with StFXAUT Members who challenged, inspired, or helped in some way. This issue’s interview is with Marc Champoux (BBA ’88). Marc works as the Managing Director, Private Client Division, with BMO Wealth Management Inc. Marc also served as Co-Chair of the Special Olympics Canada 2018 Summer Games Organizing Committee which took place in Antigonish from July 31 to August 4. The Beacon: Thanks for doing this, Marc. Please tell our readers a bit about yourself. Marc Champoux: Graduated from StFX with a Bachelor of Business Administration, Class of ‘88. I came to StFX from a small town in Quebec, just east of Montreal. I had never really been in Nova Scotia. I’ve never really left. The Beacon: You’re one of these X grads that didn’t hit the road. Marc: We stayed in the province and lived in Halifax for a number of years, but have lived in Antigonish for about 20 years. We’re lifers. The Beacon: What drew you to stay here? Marc: An opportunity presented itself to stay in the province, number one, workwise, when I was done. My wife is from Antigonish so that’s one of the things that drew me back. We’d never really dropped our connection to the place. When an opportunity for me came up to be able to move back here, we took it and it coincided with Claire’s career being in a place where she could move back too. Here we are. The Beacon: During your time at X was there any particular Professor, Librarian, Lab Instructor, Coady Program Staff Member, Extension Program Staff Member, Nurse Educator, or Learning Skills Instructor that helped you, inspired you, or was a mentor to you? Marc: It’s an interesting question because I was a business student, but the first name that comes to mind is Dr. Mary McGillivray, who’s an English teacher. She might be surprised by that. You realize the impact that a single boost burst of confidence has on young people’s path. I did take a number of English courses. Whether it was just something in a moment of time that said “your writing is meaningful or what you say has meaning to me”, it’s something that you don’t forget. It’s something that I’ve not shared with her. I’m sure she is aware of my deep affection for her. For 30 years I’m sure there’s hundreds of students that have been impacted by her, but I bet she would be surprised that her name pops up and I probably should have told her that myself. I think of Father Syd Mifflen in his sort of kind and gentle leadership style. He was the Dean of Students back then. You reflect back on why you deal in ways you deal and you realize that you were impacted by the people you met along the way. He’s one that during my time there, and even after, has made an impact on me. The Beacon: With Dr. McGillivray, it was something positive she said about your writing? Marc: In many ways the details are almost irrelevant. 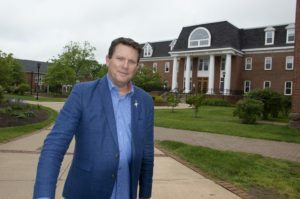 It’s just sort of that moment of interaction that we know StFX and the faculty there are noted for. Yeah, it’s an interesting one. Kent Young, who was a professor in the Business Department, again these little moments when a professor says “this is great quality work; you are doing meaningful things”. My wife, Claire, is a StFX graduate, and we both went on to Dal for professional degrees and we both often say our professions have been shaped by Dal but our lives have been shaped by StFX. She has deep-seeded roots here. The Beacon: What in particular have you taken from those experiences and been able to apply to your professional career? Professionally I’m in a leadership role with my company and, again, when you’re in a position where you’re forced to make decisions, deal with people, you realize that how you act now is shaped by the lessons you’ve learned. Dr. Tim Hynes, who is the Dean of the Business Department, and I were at school at the same time, though I did not know him well, but I was lucky enough that he approached me a number of years ago to teach a senior investment course at StFX. I got a chance to see the candid and fair way that he dealt with both students and faculty. 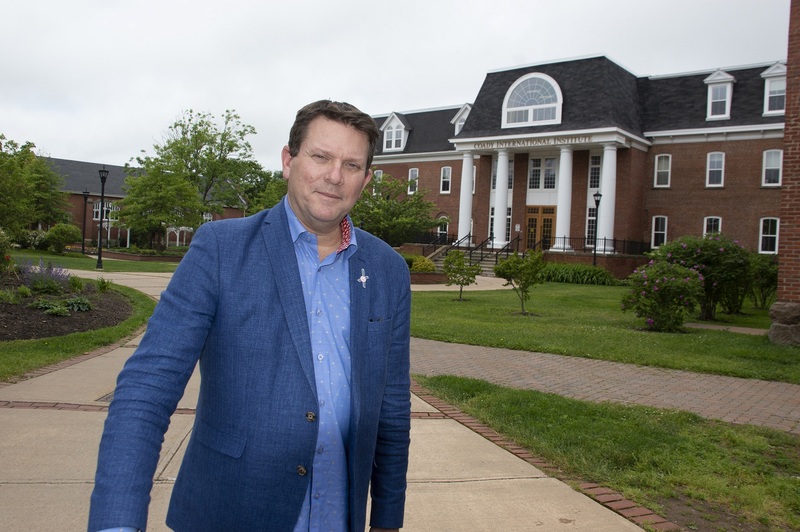 StFX now has an academy for leadership and they have Frank McKenna’s name on building for leadership, and I think it’s fantastic. It’s something that I’m proud to be connected to, but, you know, the place has a culture of fostering leadership skills that predates a lot of the buildings and a lot of the programs. This entry was posted in News and tagged alumni, antigonish, coady, committee, education, faculty, graduate, halifax, leadership, mentor, specialolympics, stfx, stfxaut, stfxuniversity, student, teaching. Bookmark the permalink. Both comments and trackbacks are currently closed.